Hi everyone! 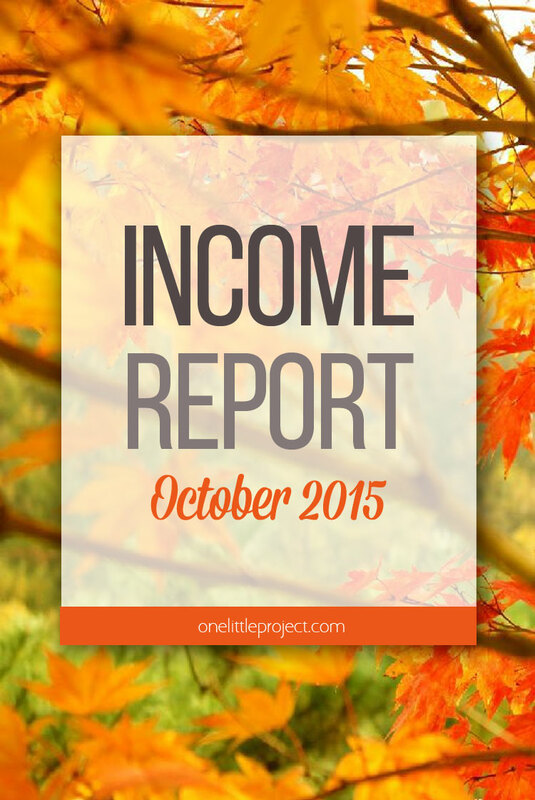 Welcome to another income and traffic report here at One Little Project! 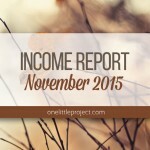 This past month was a record month for everything here on the blog! 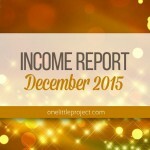 We had the highest amount of traffic we’ve ever seen, and the highest income too. October has always been an amazing month for traffic. So I’m not sure if I’ll be able to repeat these records in November and December, but it sure is a great feeling to know that it’s actually possible to make decent money blogging! There are a few expenses that I didn’t include in the list above. Things like project materials, courses I’ve signed up for, and other one time fees. I just wasn’t sure how to fit those into the list? That and I haven’t even taken the receipts out of my wallet yet, let alone organize them, so if I waited for those to be ready, I’d never get this report posted! 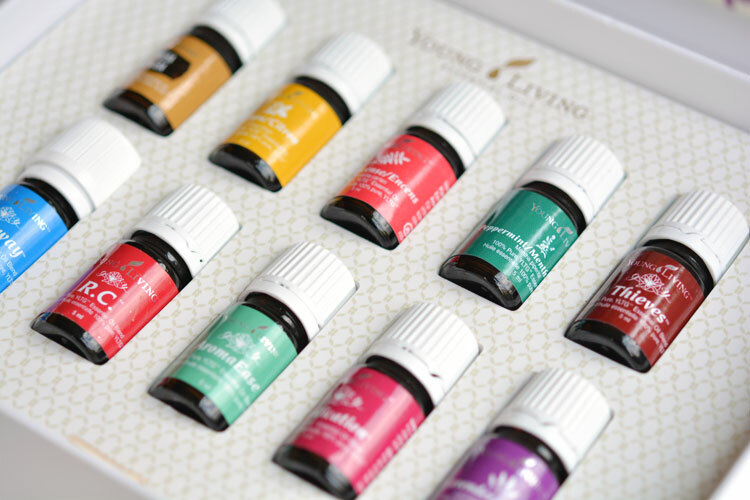 I took the plunge this month, and decided to sign up as a distributor for Young Living. Essential oils have been SO POPULAR this past year. Other bloggers seem to make a really great affiliate income from them, so I wanted to see what all the fuss was about. They sent me my starter kit, and I’ve started playing around with the oils, but I haven’t actually set up my landing page yet, and I haven’t even done a blog post with essential oils yet. With everything going on right now, it might take awhile, so I’ll let you know how it all goes. Last month I talked about why I love BlogVault. I can’t talk about every service I use all at once, because I’m pretty sure you’d die of boredom reading through it all. So this month, I’m only going to talk about Black Chicken Host. When I started blogging, I used HostGator. They were okay, and they served me well, but eventually my traffic grew to a point where I outgrew their services (around 150,000 pageviews per month). Lots of people in one of my Facebook blogging groups were raving about Black Chicken Host. I was skeptical because, well, their website just isn’t as clean, polished and corporate looking as the other hosts. But let me tell you, they are AMAZING. Any time I have a question, they answer back almost immediately. If I need something adjusted on my ftp site (which I don’t actually know how to access…), they take care of it for me. Just last week, I asked them how to set up a subdomain on my website, and they went ahead and set it up for me, less than an hour after I sent the email asking for information on how to do it. I don’t know anyone who works there, but it seriously feels like a friend is answering my emails every time I send a question. Since my traffic was so huge last month, I had to email them a few times asking to increase my bandwidth. They were so helpful coming up with an affordable solution for the sudden surge in traffic. I seriously can’t say enough good things about Black Chicken Host. Their customer service just ROCKS. If you are outgrowing your current host, I definitely recommend checking them out here. I’ve had good Octobers in the past, but never like this. This past month was amazing! If ever there was a month that made me feel like I can actually be a professional blogger, this was the month. I crushed my previous record for traffic. I had a whopping 661,727 pageviews for the month which works out to 21,000 people per day. It was amazing! It’s so nice when you plan for something, and it actually works out. If you check back in my archives, you can see that I posted my first Halloween post back at the end of July. Yes, JULY! Holiday traffic is insane, and I wanted to make sure I was really prepared to take advantage of it. So all through August I posted the odd Halloween post, and then I really started to pick up the quantity of Halloween posts in September. I slowed down with the Halloween posts in mid-October for two reasons. 1. I was preoccupied with planning my first product (Woo! More on that in a minute!) and 2. Posting holiday posts less than two weeks before the actual holiday doesn’t really benefit you until the following year. Or at least, I find it doesn’t benefit me. Pinterest takes so long to throw your new pins into their algorithm that the chances of a new post seeing any kind of significant traffic less than two weeks before the holiday is way less likely than it used to be before Pinterest rolled out the Smart Feed. I definitely think the more holiday posts you have, the better chances you have for traffic. So if you post Halloween posts right up until October 31st, I’m not saying it’s a problem, I just find for anything on One Little Project, it doesn’t see much traffic until the following year. Not surprisingly the top posts of the month were mostly Halloween related. Except for one lonely Christmas post. It amazes me how early people start thinking about the holidays! It was great to see another month with significant growth to my subscriber list! It worked out to about 41 subscribers per day, on average. I played around with some of the options in Hello Bar to see if I could increase my conversion rate. I was able to increase it to 0.3% conversion if I used the wiggling button option, but I just couldn’t bring myself to keep it there all the time. It was irritating the heck out of me when I was on my own website, so I can imagine it would be a turn off for visitors. I also took the plunge and signed up for ConvertKit this month. I’ve been using Mail Chimp since I started blogging, but back in September I finally went over the “free” 2000 subscribers I’m allowed. I’ve never been a huge fan of Mail Chimp because I find it unbelievably confusing to use. I’m still pretty new to ConvertKit, so I can’t report on how effective it is, but oh my goodness, it is SO EASY to set things up! Drip emails, sign up forms, lead pages – ConvertKit makes it really easy! No real change in my RPM this month, which isn’t surprising, since I didn’t add any new revenue streams. Although, I was happy to see that it held steady, even though I had a huge increase in traffic. I said last month that I want to increase my RPM to something closer to $10, but I can’t do it if my only source of income is ad revenue. I’ve been wracking my brain for almost a year, trying to come up with a product idea. I’ve been focusing on growing my Facebook page all year, and it’s been going really well. My engagement is through the roof. I’ve gone from 2000 Facebook likes to 48,000 likes in less than a year. And I’m getting pretty good at finding content that my fans seem to really engage with. Back in early October, a fellow blogger was asking me for advice on how she could increase the engagement on her Facebook page, and I realized, my product idea was right in front of me! So I’ve decided to create a course called “Facebook for Bloggers” to show exactly what I’ve done and how other bloggers can achieve the same success on their Facebook pages. I may not have a million fans, but my growth this year has been pretty awesome. I’m really excited about it! I spent a good portion of October researching all the technical aspects – setting up my new subdomain, setting up an e-commerce store on my new website, setting up a subscription based, password protected course, researching programs for recording my screen. It’s been overwhelming, to say the least, so I haven’t been publishing new posts to the blog as often as I usually do. But I think I’ve gotten most of the technical details sorted out now. I’ve written almost 10,000 words of content for the course already. So now I just have to format it, record the videos, and compile it into a two week course. It’s all so new to me, and I really have no idea how well it’s going to go over, but if I don’t try, I’ll never know. 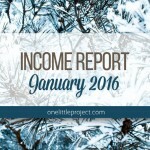 I’m aiming for a January 2016 release for the course. I’m scheduled to head back to my day job part time, starting in January, so I’m really hoping to finish up all the course planning before then. I’ll send more details to the list when I know for sure! I love how easy ConvertKit makes it to add forms! If you scroll to the bottom of this post, you should see an example of the ConvertKit subscribe form for my new Facebook for Bloggers course. Just add your email address and I’ll let you know when the course is available! 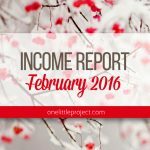 I love reading other blog income reports and seeing the different ways to make money from your blog. After reading your wonderful post I decided to hop over and checkout The Bloggers Network, and I joined. I haven’t finished all the enrollment but I got to the point where they want my blogs login info. My question is did you give them yours or is there a way to make a separate login for a different user? Kind of leery of giving someone that info. I would appreciate any advice on this. Thanks! The Blogger Network has been amazing for me, so I hope you’ll have good results too! My income seriously tripled when I switched over to them from doing the ads on my own. I created a new admin user for the Blogger Network, so yes, they definitely have access to my site, but not my personal login info. They only use it to add the ads to your site, so you can delete them as a user as soon as they’re finished if it makes you feel better. Good luck! Hi Debbie! Thanks so much for getting back to me so soon. I am going to set up another admin user account like you suggest. I am so looking forward in seeing how this goes, and the course class that I’m receiving since joining. Thanks so much for your help, and you have a wonderful day! Loved reading this! Such great advice about scheduling holiday action waay before the holidays. I posted a couple Christmas posts righ at the beginning of November and they are already getting attention. And thanks for the recommendation on Black Chicken, I’m with Host Gator too, but it’s great to have such a personalize service. Also, that FB class looks amazing! featured this on my Round Tuit post this week! up! Hope you have a great week!